When I first started this blog, I began with the story of my great-grandfather George Edmund Pleau and continued with all his siblings. It’s high time that I return to that family line, starting with his parents. I assume that my great-grandfather was named after his father, George Pleau (though I don’t know if my great-great grandfather had a middle name). George Pleau was born on August 2, 1843 in Trois-Rivieres, Quebec. He was the fourth child and fourth son of Eduouard Pleau and Julie LaMothe (their third son was also named George, but died as a baby in December 1842). He was baptized at the Cathedrale de l’Assomption on the day of his birth. George grew up to be a shoemaker, which was his life-long occupation. Marie Emma E. LeClair was born and baptized on February 18, 1849 in Montreal, Quebec. Her baptism was at Notre Dame de Montreal. Emma, as she was commonly called, was the daughter of Joseph LeClair and Marie Julie Charpentier and had at least one brother named Joseph Napoleon. Napoleon Charles (who went by Charles), born March 30, 1870 (click here for his story). Cordelia, born January 1874 (click here for her story). George Edmund, born December 27, 1875 (click here, here and here for his story). Albert Joseph, born January 30, 1878 (click here, here, here and here for his story). Eugene Jule, born February 19, 1881 (click here, here and here for his story). Evelyn L, born February 1883 (click here for her story). Ella Jane, born March 10, 1888 (click here for her story). Lucy, born 1890 (click here for her and Ida’s story). I do see that George was enumerated with his parents in the 1871 Canada Census (between Charles and Cordelia’s births), but I assume the stay was for a short time. He was in Rochester to stay, and the Pleau family lived at many addresses throughout the central Rochester area. There seems to be a blip in George and Emma’s marriage: the 1892-1893 City Directories show them as living apart. For whatever reason they were separated, they were back together again for the remainder of their lives. As their children married (and sometimes re-married), George and Emma never had an empty nest; the family (particularly the sons) came and went, and George and Emma themselves spent their last years living with daughter Evelyn and her husband Charles. George died on September 13, 1914 and Emma on February 8, 1918. 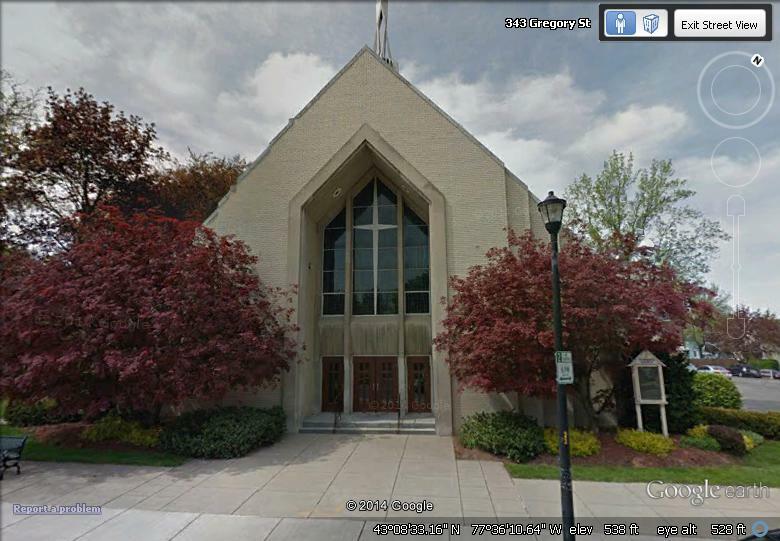 I can’t find any accounts of George’s funeral, but Emma’s was held at Our Lady of Victory Church, which (being French Catholic) I assume was their home church. Both are buried at Holy Sepulchre Cemetery in Rochester, where I was able to find their gravestones easily first online, then in person. 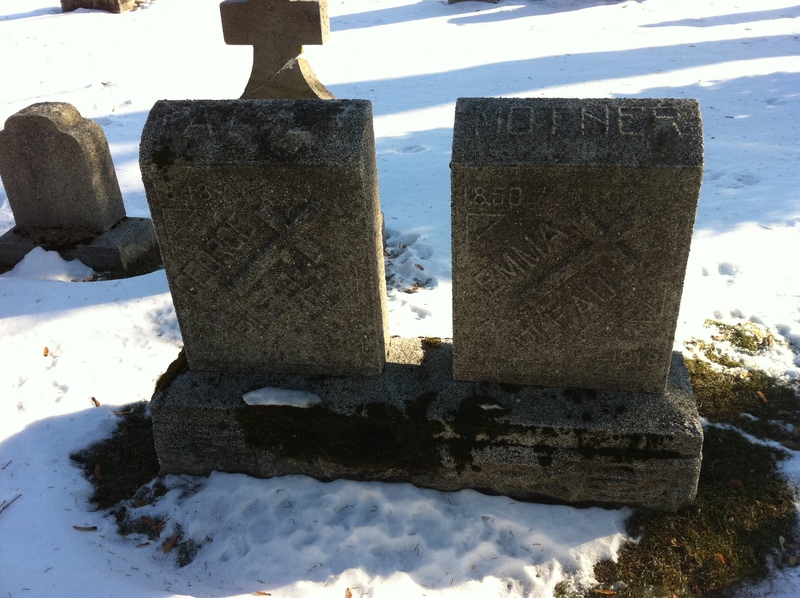 Found in Section M: George and Emma Pleau’s graves in Holy Sepulchre Cemetery! Author’s collection. It was an amazing moment for me to stand at their graves, connecting with a family whose name I had but only recently had gotten to know them through my research. Ella Jane Pleau was born March 10, 1988 in Rochester, NY. Although she was the second to last child born to George and Emma Pleau, she became the baby of the family after the death of her younger sister Lucy in 1895. Ella worked as a clerk in a photograph company, which I assume was Eastman Kodak. On December 27, 1911, she married Chester B. Britenstool in Rochester, NY (more on that in a minute) by clergyman R.R.M. Converse, witnessed by Elizabeth Foster (perhaps a friend?). Chester, the son of Julius Britenstool and Ella Bryant, was a tailor and later a clothing designer. 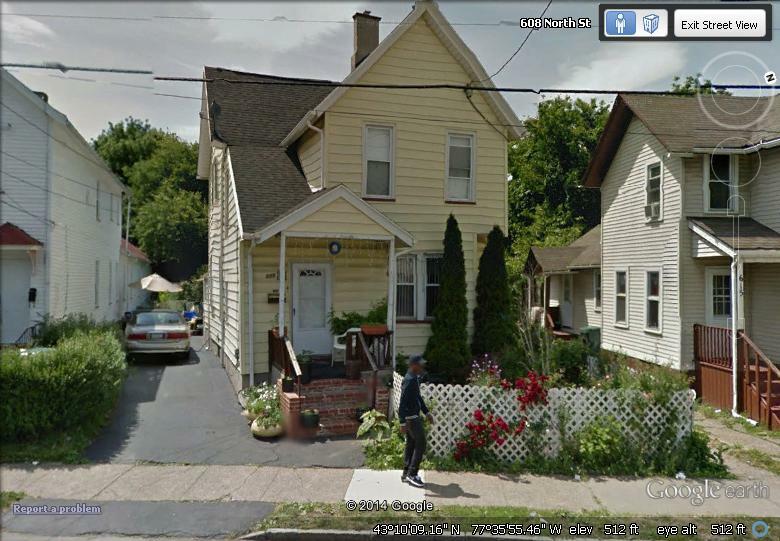 The couple lived with Chester’s mother at 93 Prince Street, then at other locations in Rochester. They moved to Buffalo, NY in 1917 and back to Rochester in 1929. Eventually they moved to Webster, NY by 1944 and lived there at least through 1965. They appeared to have returned to Rochester by the time Chester died in June 1970. Ella died November 16, 1980. Ella’s funeral, like her sister Evelyn’s, was at St. Boniface Church. Both Ella and Chester are buried at Mount Hope Cemetery in Rochester, next to Chester’s parents. 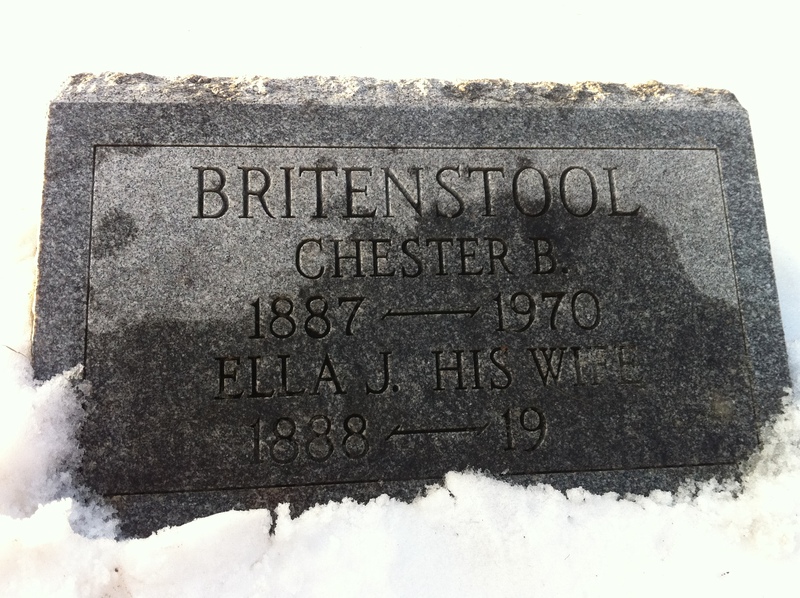 Grave of Chester and Ella Britenstool. Author’s collection. On New Year’s eve at the home of the bride, No. 609 North street, there was a wedding reception for Ella J. Britenstool, youngest daughter of Mr. and Mrs. George Pleau, who on Wednesday last became the bride of Chester Britenstool. [I wonder if they took a short honeymoon before returning to celebrate.] The bride wore white serge and carried roses. The dining room was decorated with holly and wedding bells, and the table with ferns and pink carnations. [This tells me that George and Emma shelled out some money for this, if they got flowers and greenery in the middle of a Western New York winter! And doesn’t this sound pretty and festive?] There were musical selections by Miss Florence Weber, Mr. and Mrs. Charles Weilert, Albert[,] George, Jr., and Eugene Pleau. [First, I am concluding that they must have had a piano in the house. Second, what a musically talented family! And what a joyous time they must have had!] Mr. Britenstool is a son of Ella M. and the late Julius Britenstool, of No. 93 Prince Street. A modern view of 609 North Street, Rochester, NY. Courtesy Google Earth. I can only imagine the scene, with snow on the ground outside the home, but music and laughter coming from the inside; the entire family together in celebration. This will be a short post, because both Ida and Lucy lived very short lives. Ida was born in 1885, after Evelyn and before Ella. She probably attended school for a time, and passed away on April 18, 1896. Lucy was the last child born or George and Emma Pleau. She was born about 1890 and died on July 2, 1895. This was only two months before her pregnant sister Cordelia got married. I wonder if her death (and perhaps illness?) contributed to delaying the wedding. 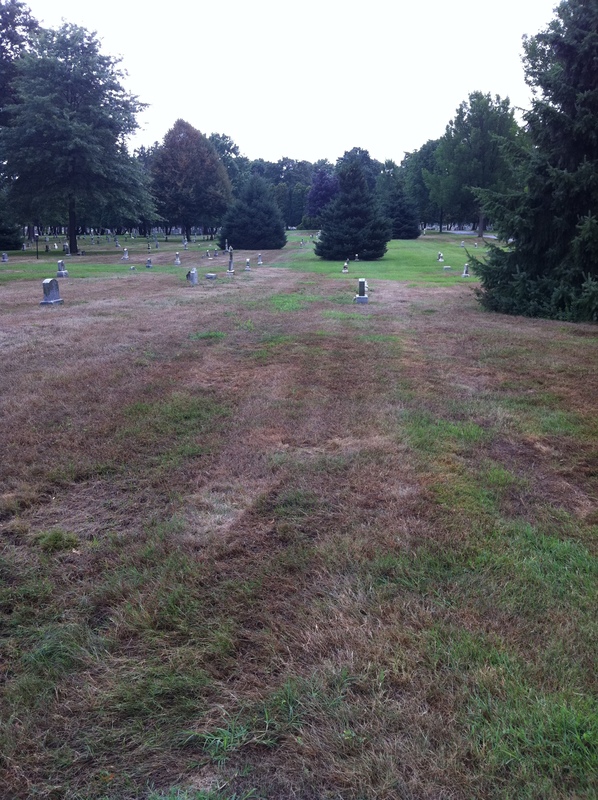 Both Ida and Lucy are buried at Holy Sepulchre Cemetery in Section I, which is a children’s section of the cemetery. As I tried to look for their stones (which do not exist or are gone now), being in this section made my heart break for all the parents. There were many stones with little lambs on top and laments inscribed on the side. My thoughts go to Emma, who lost her two little girls within a year of each other. Did she want to provide a stone for her daughters? Were they too poor to do so? I was glad to be able to be close enough to the graves to pay my respects to these little-known Pleau children. Evelyn L. Pleau was born in February 1883, I presume in Rochester, NY. She had an eighth grade education. Like her father and most of her brothers, spent some time in the shoe industry, working as a shoe stitcher in 1990. Evelyn married Charles W. Weilert on February 12, 1902 in Rochester, NY. Charles seems to have started out as a wood finisher, but spent most of his life as a driver. By 1940 he was unable to work. The Weilerts had no surviving children. They had a stillborn child in October 1902, which was buried in Holy Sepulchre Cemetery, and at least one other child that died before 1910. Both Evelyn and Charles had some musical talent; having performed with her brothers and niece Loretta Webber at her sister Ella’s wedding reception. Throughout my research of the Weilerts, it seems to me that they were generous with their home. Evelyn’s parents George & Emma lived with them till the ends of their lives in 1915 & 1918, respectively. Her brothers George and Eugene lived with her & Charles at various times; in particular, George lived there when separated from his first wife, Agnes. Charles’ generosity also was demonstrated by contributing to a fund to help Anna Hasman & her children, who suffered malnutrition & the effects of coal fumes in December 1928. Charles died in December of 1947, and Evelyn moved to Webster, NY by 1948. I wonder if she lived with Cordelia and Leonard? St. Boniface Church. Courtesy Google Earth. Eventually, she moved back to Rochester, where she died on November 29, 1965. Her wake was held at MJ Miller’s Son Funeral Home the next day, and funeral was held at St. Boniface Church in Rochester on December 2, Her death notice in the paper mention her survivors as sister Ella Britenstoool, niece Florence Webber, “and two nephews.” Although unnamed, I know that they are George Albert Pleau (brother Charles Pleau’s son) and George Edmund Pleau (brother George’s son and my grandfather). I wonder if they ever knew this aunt, although I can say my grandfather didn’t seem to be able to recall her specifically when I asked about his father’s family. 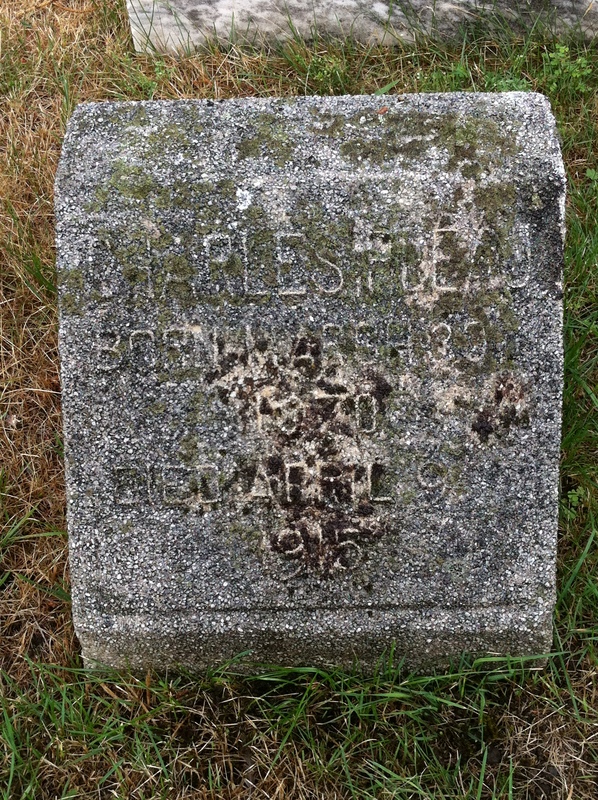 Like much of the Pleau family, Evelyn and Charles are buried at Holy Sepulchre Cemetery. 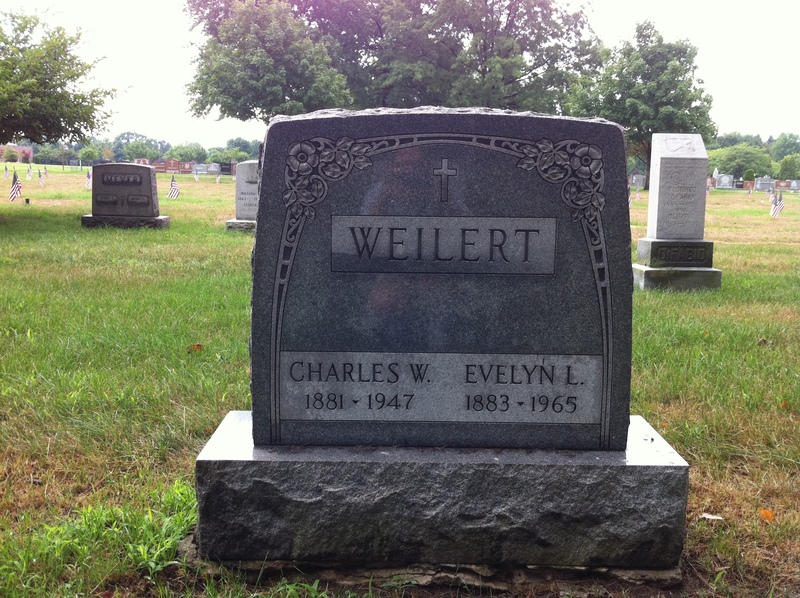 Charles + Evelyn Weilert grave. Author’s collection. Typical of most genealogical research, I have less information on the women of the Pleau family than the men. However I do feel compelled to include them and their families in their own articles. Cordelia Pleau (sometimes called Delia), the oldest daughter of George Pleau and Emma LeClair, was born January 1874 in Rochester. Her education ended after seventh grade, and I assume that she went to Our Lady of Victory School like her brother George. As an adult she worked as a tailoress in Rochester until a couple of years after being married. Probably the most significant thing I found on this family was a newspaper article that claimed on October 21, 1896 Leonard ” punished Gregory Liebeck with his fists”. Leonard claimed that this was a case of mistaken identity and had a lawyer to defend his case. I don’t know the outcome of the case at this time. I assume that the outcome was positive, but without court records I can’t know for sure. The Webber family lived in various places in Rochester, then Leonard used his carpentry skills to build a new home at 458 Electric Avenue, where they lived from 1914-1936. 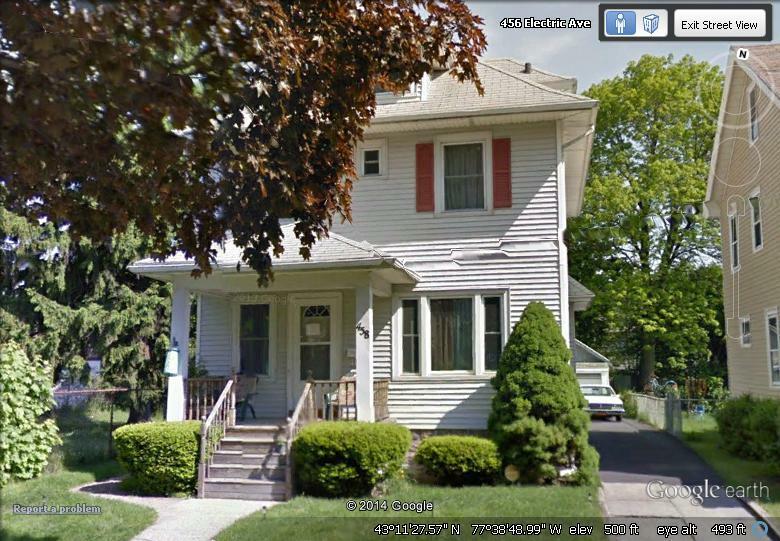 458 Electric Avenue, Rochester NY. Courtesy Google Earth. Leonard retired from carpentry in 1936 and the family moved to nearby Ontario, Wayne County, NY. Meanwhile, Loretta and Florence worked various clerical jobs; Loretta as a bookkeeper and Florence as a secretary. After about another ten years, they moved to nearby Webster, NY. Leonard died of a heart condition on September 23, 1949 after being rushed to the hospital. Cordelia remained in Webster and passed away there on November 4, 1952. Both are buried in Holy Sepulchre Cemetery in Rochester. 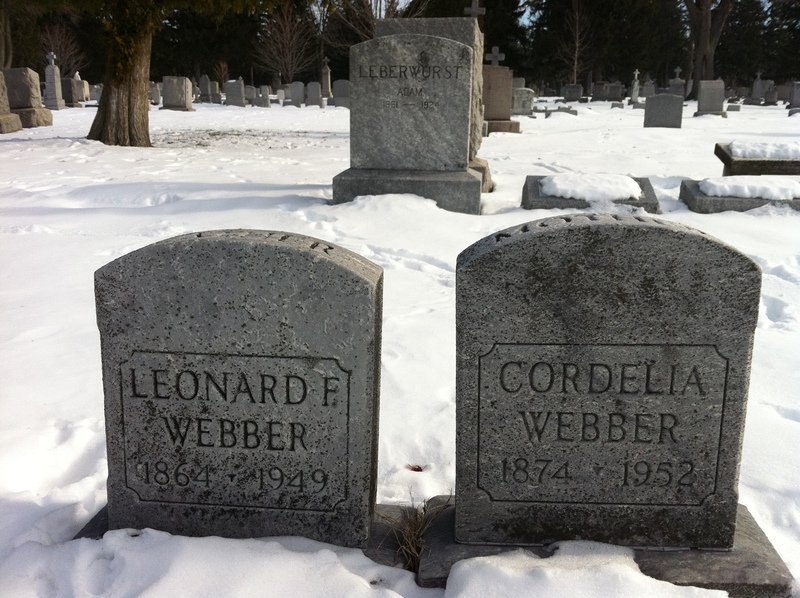 Graves of Leonard and Cordelia Webber. Author’s collection. Loretta and Florence seemed to have moved back to Rochester, and neither of them ever married. Loretta died December 22, 1966; Florence died June 12, 1995. Both buried next to Leonard & Cordelia at Holy Sepulchre. 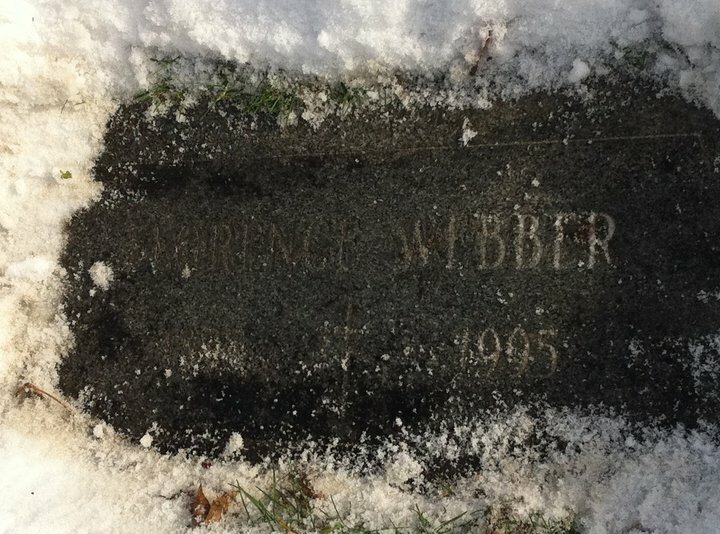 Florence Webber’s grave. Author’s collection. Seeing Florence’s death date on her gravestone made me regret not pursuing genealogy sooner. I married a Western New Yorker in 1992 and we often passed through Rochester on the way to my in-laws. If I had only known of Florence, I could have made the effort to meet her before she died! *Leonard spelled his last name Weber until 1914.